Graphic designer graduated from IPEVE (Universidad Diego Portales, Chile) and self-taught type designer. He teaches typography at Universidad Católica de Chile. Francisco is author of the book Educación tipográfica, una introducción a la tipografía, published in Chile in 2004 and then a year later in Argentina. 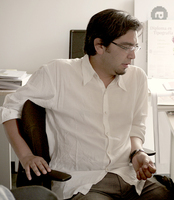 He is one of the founding partners of AGR Diseño and Frescotype. Each studio specialises in font design, information design, and corporate identity design. Some of his most famous typefaces include: Australis, the Gold Prize winning typeface of the Morisawa Awards 2002 International Typeface Design Competition (Tokyo, Japan); Elemental, the 2002 Altazor Awards winning typeface; font families for newspapers such as La Discusión (Chillán), and La Cuarta (Santiago) in collaboration with Rodrigo Ramírez; the typeface for the information system of Santiago Public Transport (Transantiago); the typeface used on Chile road signs.